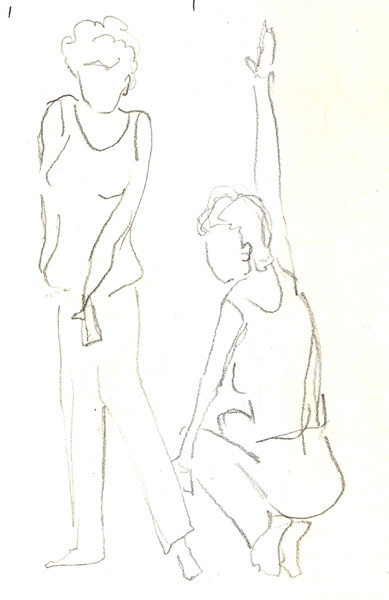 This week my friend Pat met me for lunch and then went to the Battery Park City Summer Drawing figure drawing session. She always worries about whether it will be too hot, but the setting is beautiful, with cross breezes from the Hudson River. This was a great opportunity for her to figure out whether she could sketch all of the poses on her iPad - and she could! I'm used to 2 minute warmup poses and find the ten 1 minute poses at this site a real challenge. But I thought I should share a few. We did 12! 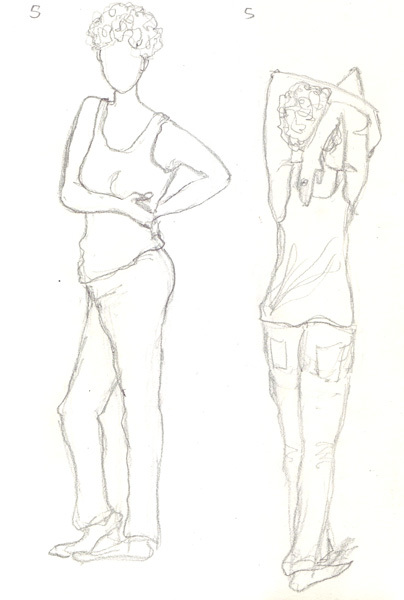 The next drawings are from the 5 minute and 10 minute poses - with which I'm much more comfortable. The model was terrific and suddenly, when you looked up, she had transitioned to a new pose effortlessly and quietly. The two hour session ended with a 20 minute pose. 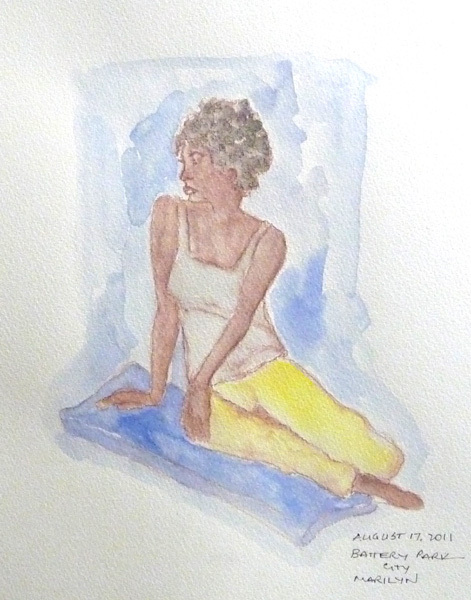 I sketched her in brown watercolor pencil and then added watercolor and watercolor washes. I really enjoy drawing figures and have a variety of exercises that I've done over several years to practice sketching body parts: faces, hands, and feet. 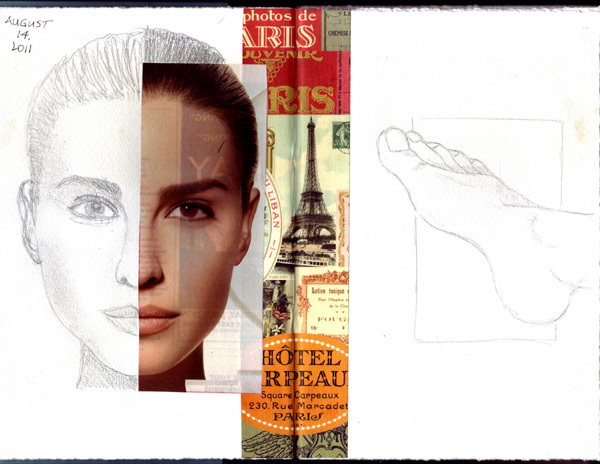 Drawing faces: I save full face portraits from magazines and for this exercise I divide them in half vertically. I collage one half of the face to a sketchbook page and then sketch the missing side - trying to copy the original as closely as possible. I saw this idea on a website or blog, but don't remember where. Drawing hands: I have an articulated hand, that I bought second hand at a mannequin supply store in Manhattan, that I can position and then draw. And for almost two years I worked my way through a website with photos of hands forming the American Sign Language letters. I just finished Y and Z - so I'm done. 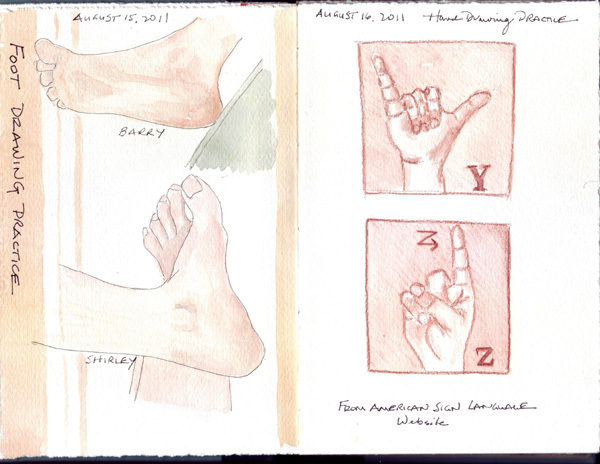 Drawing feet: So far most of my sketches are of my feet and my husband's feet as we sit watching TV. 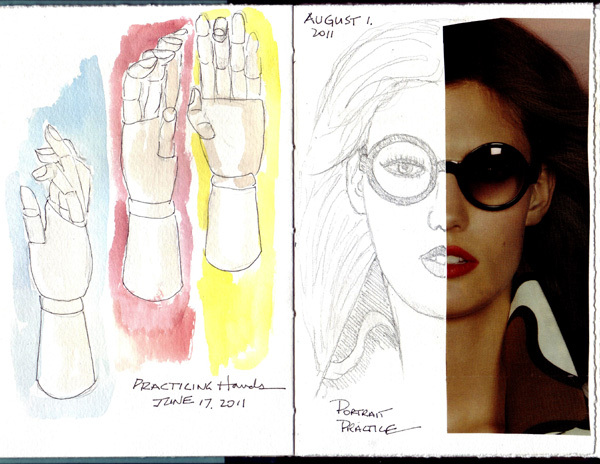 Here are the last 6 pages in my practice sketchbook. My 93 year old Mother fell and broke her right hip and shoulder last November. 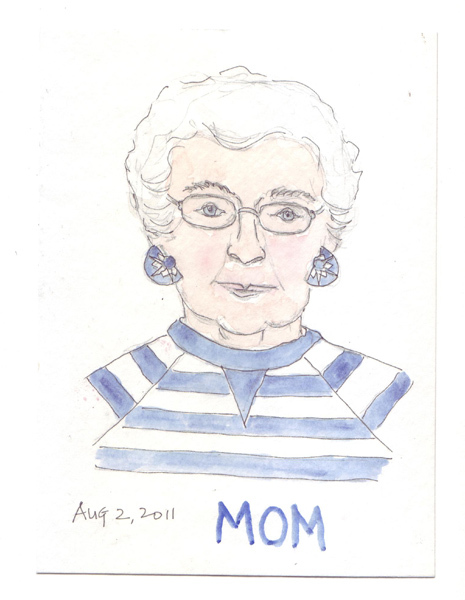 She lives in a retirement community in New Jersey, about an hour drive outside NYC. 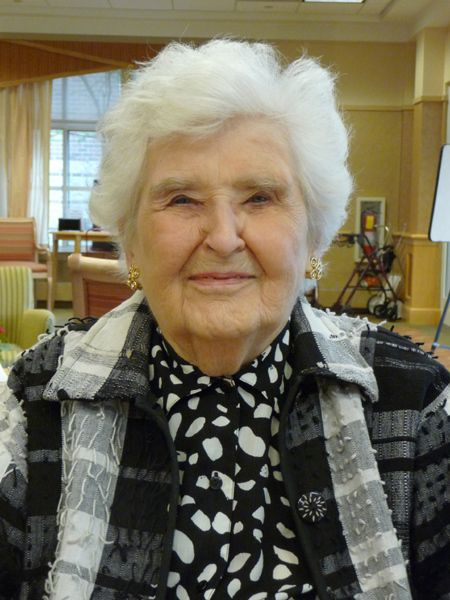 She has her own apartment, but now requires a home health aid 24/7. Since her injury, hospitalization, and rehab, I visit weekly. Sometime in the morning, we go for a "walk" and sit in the big recreation areas or on the patio. 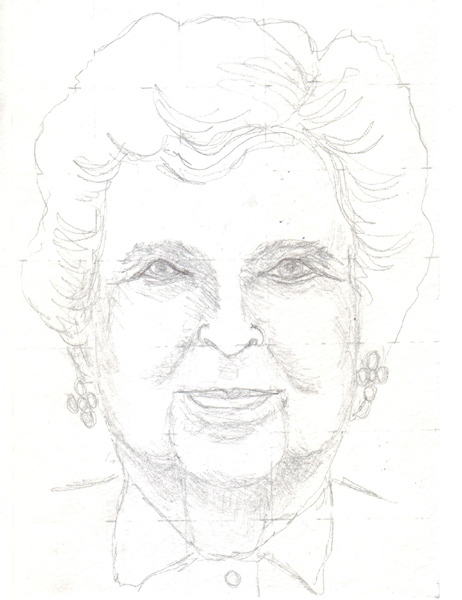 And we laugh, alot, as I try to sketch her portrait. Her she is in a photo. 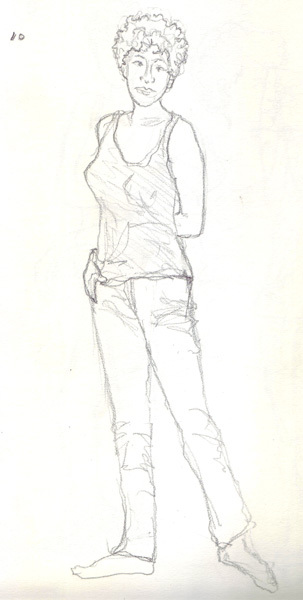 Most of my early sketches all looked like the same woman, just not my Mother. So we named her Lilly and created a persona for her. I finally decided to use a grid on a photo of her to try to get a better likeness using that time-honored technique. You can still see some of the unerased grid markings on this pencil drawing. But that didn't look like her either. Note: I used a different photo for the grid. She always looks at my drawing and says something like "great job on my hair, or the earrings." Here is the latest one - she still says that I'm not close. But at least we have fun, and it makes the visit more interesting. 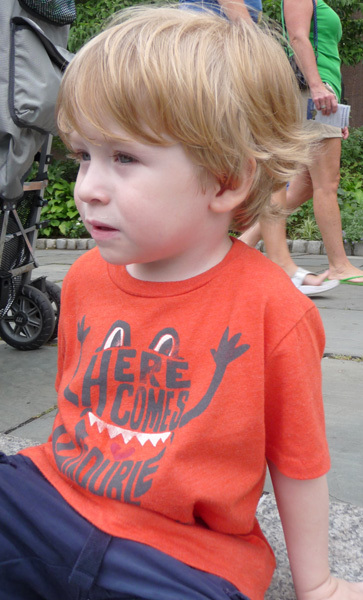 We had our youngest grandchild, Zachary, with us for the weekend. 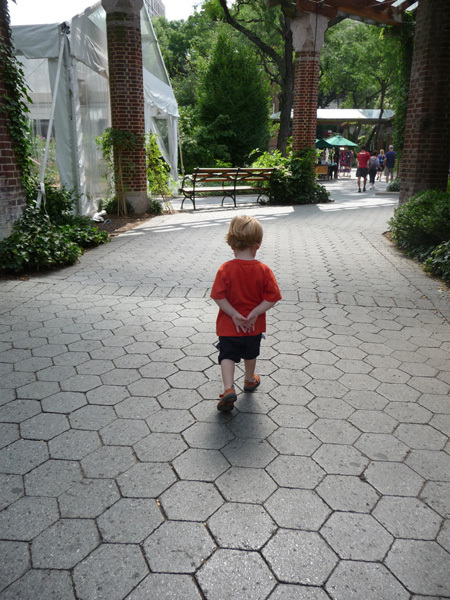 On Saturday morning we decided to take him to the Central Park Zoo and set off with stroller, diapers, snacks and camera. As soon as we tried to put him in the stroller, he complained bitterly and stressed, "No stroller." I asked him if he wanted to walk, preferring to avoid the fight, and he smiled and said yes. Zach is one year old - soon to be 2. I told my husband that he would get tired and ask to ride, and every several blocks I asked him if he was ready to ride. I was walking at a regular pace and he was almost trotting, holding my hand. 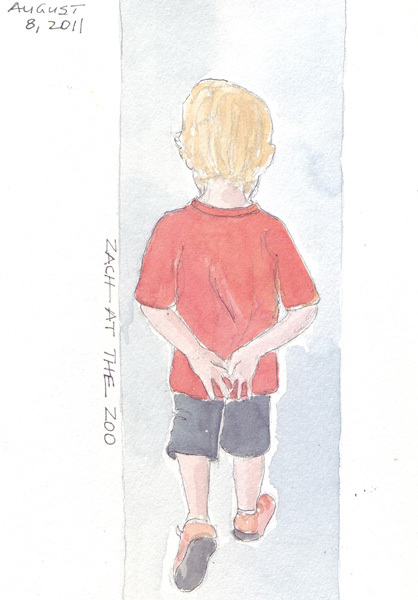 Twenty-four blocks later we arrived at the Zoo - he walked and sometimes ran the entire way!! In New York City, 20 uptown-downtown blocks equals one mile! And then he walked around the entire Zoo! I find this phenomenal and told our son that he finally had someone who would be running and cycling with him in a few years! Here he is watching the sea lion exhibit. His shirt says Here Comes Trouble! We always love the penguins. 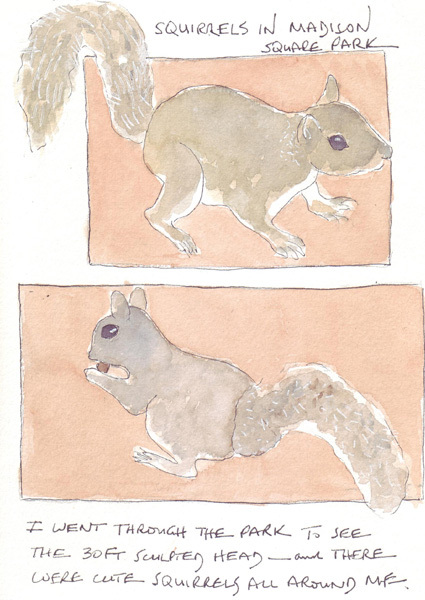 I took photos while we watched them and sketched these later during naptime. 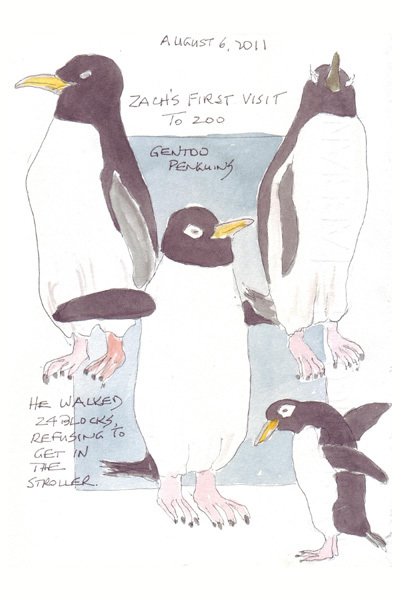 Zach saw the polar bear, monkeys, and lots of birds. Here he is walking ahead of me at the end of our visit. And he was still full of energy! Here is my sketch, to make sure that I have memories of the wonderful day. 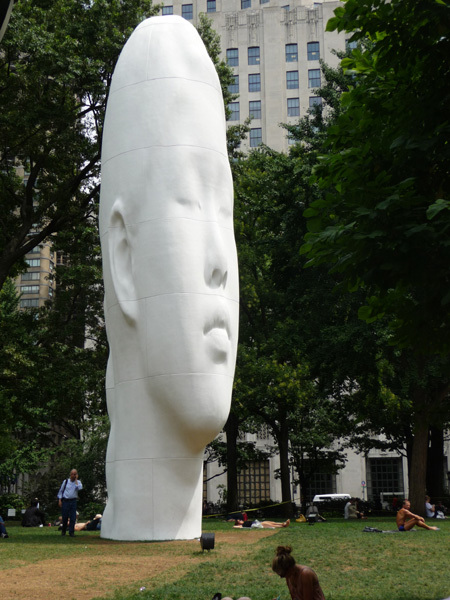 I was walking home from City Quilter and specifically walked across Madison Square Park to see the summer sculpture, a 44 foot head by Spanish Artist Jaume Plensa. I took photos of the head around 360 degrees, intending to draw it at some point, and failed to notice the honey colored squirrel that I almost stepped on. So I photographed him/her as well.